And how do I register it? I tried looking it up online, but the directions it gave didn't work. 1. Download COMCTL32.OCX (right click the text on the left and save to your Desktop). 2. Back up your current copy of COMCTL32.OCX and copy the new version to the same file location. This file should be located in the WINDOWS\SYSTEM directory on your C: drive (for Windows NT and 2000: \WINNT\system32). 3. Using your mouse, click on the "Start" button and then click on "Run". 5. You should see a message saying "DllRegisterServer ... succeeded"
If you are getting an error telling you that the file is missing, then you are not typing the command in correctly. You will need to type it in *exactly* as as shown above for your operating system. Fixed the tileset loading function. If you have any more problems, report more. Fix'd. Same process as the first one. 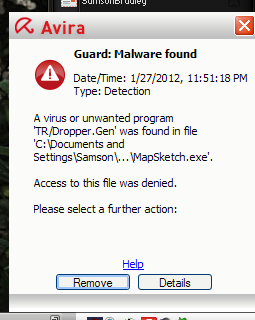 My anti virus thinks theres a virus in mapsketch.exe, jus sayin. it's probably nothing anyways. Just thought I'd show you. Hmm, I just registered the comctl32.ocx file, as it was giving me an error, but after the successful registration I get 3 other errors(in different prompts - ERROR "StarDat... BrooDat... patch_rt... could not be loaded!" Can this be connected to the remastered update? I also tried pasting the mapsketch in the main SC folder with no success. I also tried downloading the ocx from this site and pasting it next to the mapsketch.exe file - it still gave me those 3 errors(that was before i managed to register it successfully using google). my paths were wrong, of course, because I had SC installed in a different folder before the remastered. Now all is fine, thanks!